Sorry, the Corba's Are No Longer Available. Note: User manual is for the 5550PRO, which is still applicable. Enhanced Truck Restriction Routing insures you travel on permitted roads only. Truck-specific points of interest powered by ProMiles®. Includes All Major Travel Centers with Detailed Amenity Information Such as Food Options, Internet Access, Shower Availability, Etc. Pays for itself - Avoid costly tickets, avoid tolls, navigate unfamiliar territory efficiently, saving time and Fuel. Example: "In 2 miles, take Exit 23 to I-95 North"
Dimensions (H x W x D): 3.25" x 5.375" x 0.5", Weight: 6.3 oz. Last Mile Routing: 2,590 Local Municipalities, Canadian Restriction Coverage for 176 Cities, Including Province of Quebec. Quick-Tabs showing important information: Distances to weigh stations, travel centers, rest areas and mile markers. Junction View with Lane Assist: Shows 3D images of upcoming highway junctions, with lane guidance and turn-by-turn directions. The Hours-of-Service Timers enable drivers to easily track their On-Duty, Off-Duty and Driving Time. 30 Restriction Types Including Access restriction, Load restrictions, HazMat, Height, Gross vehicle weight: (weight per axle), Total length: (kingpin to last axle, kingpin to end of trailer), Width and more. Enhanced Truck-Specific Routing: Uses vehicle height, width and limits along with national and state truck restrictions to provide the best route possible. Truck-Specific Points of Interest (POI) Powered by ProMiles®: Includes all major travel centers with detailed amenity information such as food options, internet access, shower availability, etc. Commercial Vehicle Service & Support Information Powered by TruckDown™: Quickly find towing companies, repair shops, truck-friendly motels and emergency services. AURA™ Camera and Driving Hazard Protection: Avoid costly tickets with speed and red light cameras location alerts, as well as speed traps and dangerous intersection notifications. Truck Optimized Route Guidance: Loud and clear voice instructions and phonetic pronunciation of street names. 33,000 Truck-Friendly Points-of-Interest Powered by ProMiles® and TruckDown™: Includes truck stops, weigh stations, repair shops, rest stops, pharmacies and lodging with amenities including, WiFi access, showers, restaurants and laundry. Plus, over 12 million standard point of interest. 14 Truck Type Options: Including Straight trucks, Single and double trailers in various axle configurations. Multiple Routing Options: Including shortest time, shortest distance, National Network STAA. Avoid toll roads and avoid freeway. Multi-point Route Optimization: Provides optimal routing for multiple destinations to save fuel costs. 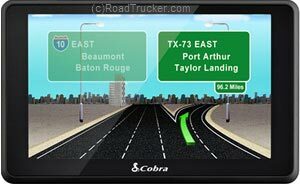 Provides truck-optimized routes for the lower 48 states and Canada.